Winter is finished, the flowers are blooming and the air is fragrant. With the arrival of spring we can look forward to spending quality time with the family at Easter. What better way to enjoy the Easter holiday with your family than with a newly renovated home? It’s a nice thought, but not everyone can afford to update their homes this spring. If you’re having trouble making ends meet this Easter, maybe we can help you with a fast auto title loan! 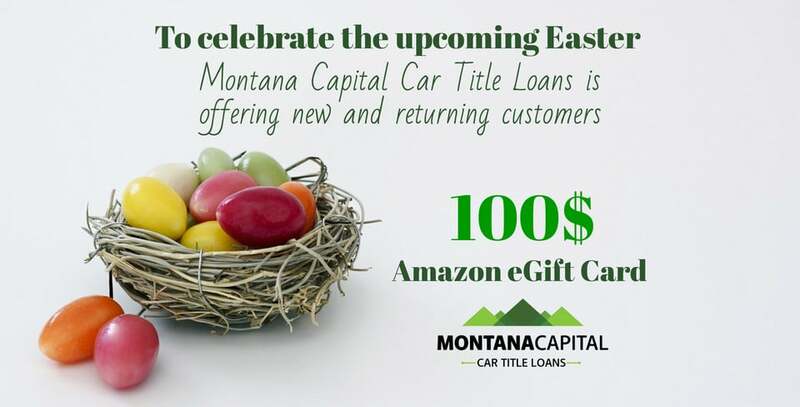 Montana Capital Car Title Loans new are returning customers can make their holiday more festive with a $100 E-gift card from Amazon*! Terms & conditions: Offer expires on 04/22/19 at 23:59. You must present this email, in print or email form, during your loan appointment. Loan approval is not guaranteed and subject to meeting our credit criteria, which includes provision of acceptable property as collateral. You must demonstrate ability to repay the loan. Coupon can be redeemed only once and is non-transferable. You cannot redeem multiple offers. Montana Capital offers loans only in the State of CA, Loans made or arranged pursuant to California Department of Business Oversight Finance Lender Law License 603F508. The APR for a typical $2600 loan is 120.656% with 36 payments of $270. Offer is available for new and returning prospects only. *$100 Amazon eGift Card: Only qualified applicants who receive a loan at a minimum amount of $2600 can redeem the offer. A $100 eGIFT card will be sent to the email address provided by the qualified applicants at the time the loan is funded.